Like Forrest Gump, you can never have too many grits. Grits and eggs, fish and grits, shrimp and grits, grits and Pimento cheese, Smoked Gouda Grits. The list goes on and on! We were raised on Grits and bacon with a fried egg. You can find the best grits at a local stop wherever sweet tea is sold! 1Add Milk, Water, and Kosher salt in large pot and bring to a boil. 2Slowly add cornmeal whisking to incorporate. Reduce heat to low and place a lid on the pot. Stir every 3-4 minutes to prevent lumps. 3Cook until creamy but still a little bite left in the cornmeal, about 25 minutes. Remove from heat and incorporate the sharp cheddar, butter, and pepper. Let stand 5 minutes before serving. 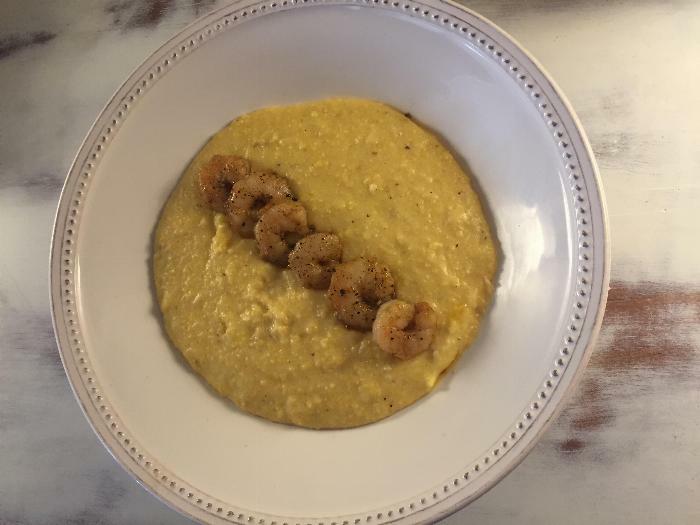 Yellow corn meal is your best bet for cheese grits, although you could use hominy if you like. The sky is the limit on additions. Shrimp, a side of catfish, sausage, or bacon would be just fine. Try it!